It seems like I could begin every blog post by referring to the growing demand for ubiquitous access to Wi-Fi, and every day there seems to be less hesitation to ask for wireless access everywhere a few people might gather. At times, wireless professionals are tasked with deploying a network in a temporary location for conferences, large public meetings, outdoor festivals, etc., and very few good solutions to properly securing and orienting an access point have existed until now. Based on some hands-on time with the this product, that changes with the introduction of the Wi-Fi Stand by Frontera Consulting. Wi-Fi Stand is actually not a full, adjustable height stand. Rather, it's all the "hard parts" about temporarily mounting an AP assembled into an easy to store and deploy solution that you can attach to the style and size of stand of your choosing. The frame consists of 1/4-inch industrial-grade PVC plastic, cut to outer dimensions of 12 inches by 8 inches, with an inner opening of 10 inches by 6 inches. On the inside-top, they've attached and aluminum 24mm rail designed to replicate the most common acoustical ceiling grid rail sizes. This clever design allows easy attachment of most enterprise-grade access points with minimal effort, as nearly all of them include either built-in clips or a simple add-on bracket to facilitate such installation. The bottom of the frame includes a vertically, oriented, female-threaded cylinder that allows for quick attachment to a 1/4-inch #20 male thread found on a wide-range of collapsable tripod stands. I happen to own a couple of 12-foot tripod stands that were designed for photography lighting, but would be well-suited for an indoor or outdoor WLAN setup for a day or three. For my hands-on review, I opted to just use a common, 60-inch camera tripod, to which the Wi-Fi Stand attaches in seconds. Keep that in mind for smaller, lower-density scenarios when suspension of an access point well-above head-level isn't required. One Wi-Fi Stand and a lightweight tripod may be all you need. In short, it holds up very well. When I first heard about the Wi-Fi Stand I knew I was immediately interested, but I was also anxious to get my hands on one to check out its stability and durability. This had nothing to do with any suspicion of manufacturing quality. I was curious to see how Frontera Principal and Solutions Architect Drew Lentz and his team balanced an RF friendly design with sufficient strength and stability under a real-world load. Let me explain a bit further: The Frontera team clearly knows a thing or two about successful RF design and implementation, and one thing wireless professionals are very careful about is keeping foreign metal objects away from an access point whenever possible to avoid attenuation, scatter, and reflection problems. 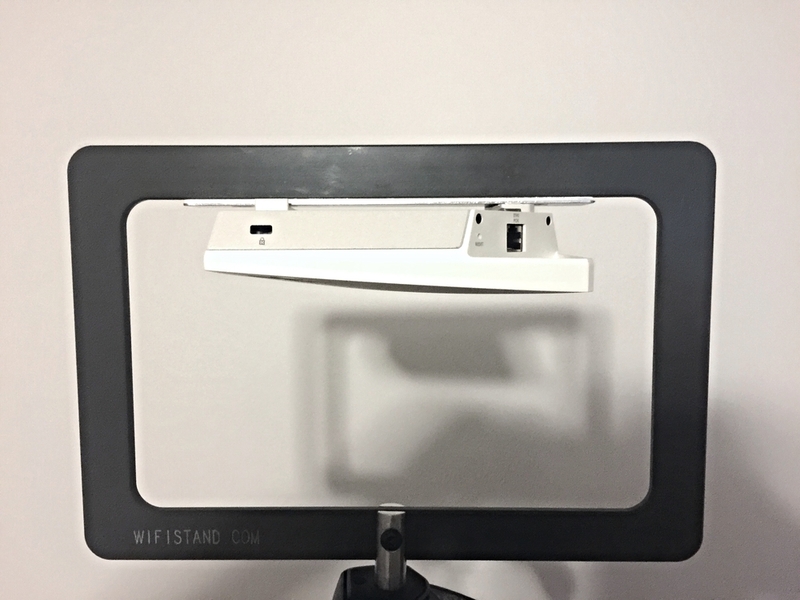 By choosing a rigid frame of PVC plastic, and using aluminum only for the mounting rail and tripod connector, the Wi-Fi Stand takes great care to avoid any such potential issues. I tested the Wi-Fi Stand using two enterprise-grade access points that would be considered well-suited for temporary wireless deployments: Aerohive's AP130, and Cisco's AP-1832i. At one end of the size and weight spectrum, the relatively diminutive AP130 is an 802.11ac 2x2 access point that measures a mere 4.5x4.5x1 inches, and weighs in at 1.14 pounds. 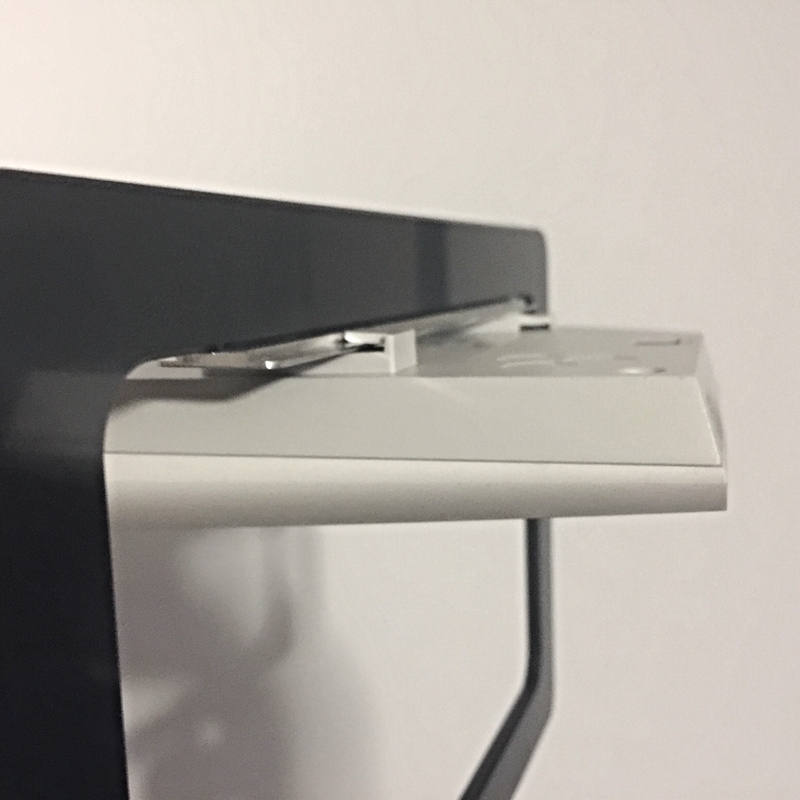 It's built-in grid-ceiling mounting clips fit nearly perfectly on Wi-Fi Stand's 24mm mounting rail, which allows for easy attachment and removal without any sense that the AP could accidentally come loose and fall. By contrast, the 3x3 MU-MIMO Cisco model checks in at 8.3x8.3x2.6 inches, and a hefty 3.69 pounds (including the required ceiling grid mounting bracket). 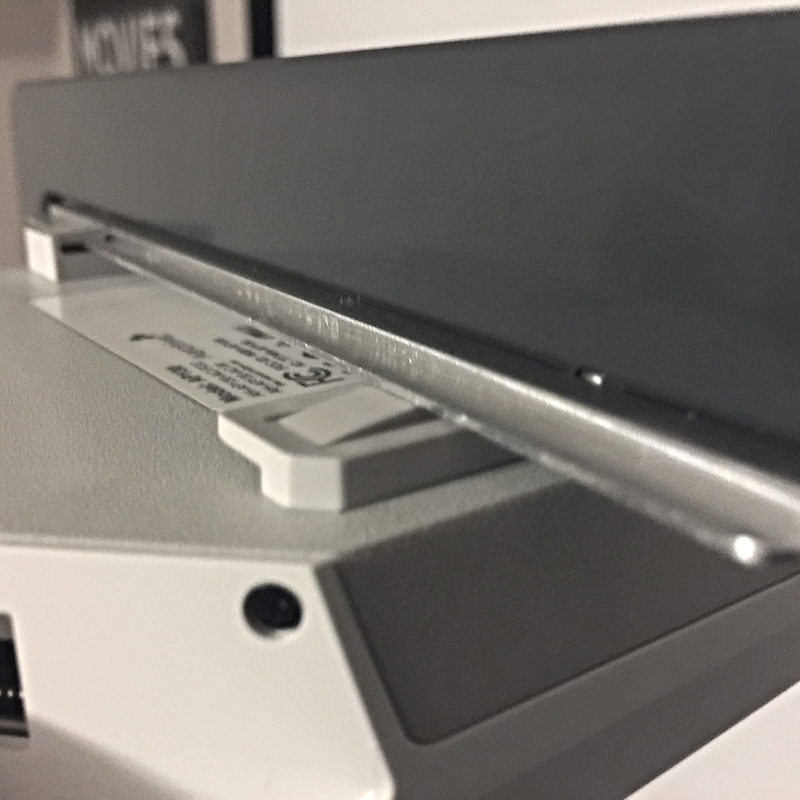 The larger AP1832i still attached and removed without much trouble, although the most secure attachment will require adding an additional screw to the Cisco grid ceiling bracket after it's affixed to the Wi-Fi Stand rail. Neither access point exhibited an unexpected amount of wobble--either at the attachment rail or the tripod stand connector. I carried the full assembly with each access point around a large room to get a feel for how everything holds together when everything isn't standing perfectly still and upright. With the smaller Aerohive AP130 this was no problem, but I recommend a little more care with heavier equipment. While the Cisco 1832i never came free, bent, or broke anything, over time I can foresee lateral stress on the mounting screws between the 24mm mail and the PVC frame becoming loose if carelessly moved around with a large AP attached. Overall, I found the Wi-Fi Stand to be a very usable solution for most temporary Wi-Fi deployment scenarios. It's ability to securely accommodate a wide range of enterprise access points at an affordable price, without a large halo of signal-mangling metal, offers a great option for wireless pros needing to provide access where permanent mounting solutions are not possible or practical. If this describes you, go ahead a purchase one (or as many as makes sense). This was an unsolicited review of a product I purchased. I was not compensated in any way, and have no business relationship with Frontera Consulting. That said, Drew Lentz is a pretty good dude, and you should get to know him. The Cisco AP1832i actually fits easily within the frame despite the perspective of this photo. From this perspective, you can see the adequate space within the frame for even large enterprise-grade access points such as the AP1832i. The Cisco AP1832i attaches via its included ceiling grid adapter and mounting plate. Cisco's design is very secure and stable. As expected, the Aerohive AP130 has plenty of shoulder room within the frame of the Wi-Fi Stand. The Aerohive AP130 clips securely to the 24mm mounting rail with minimal effort using its built-in tabs. The Wi-Fi Stand threads onto a 1/4" #20 male thread found on many tripod stands.